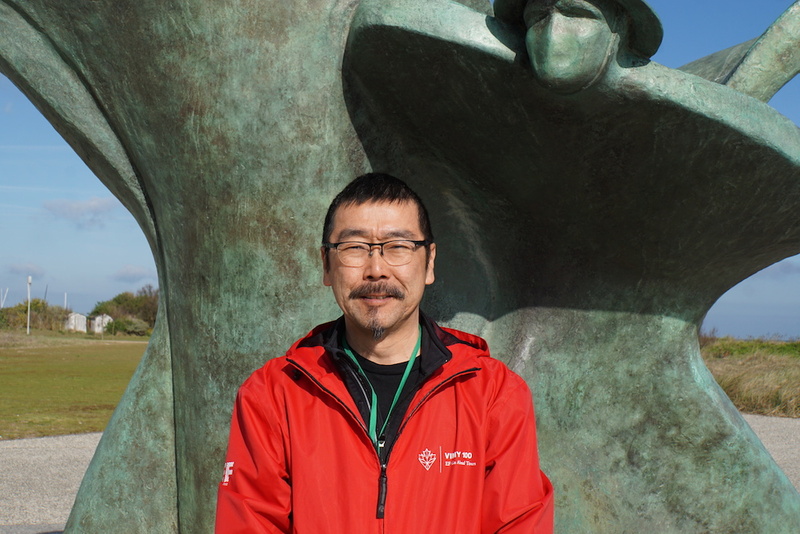 We were thrilled to recently welcome Mark Ishii to the Juno Beach Centre. Mark is the grandson of Masumi Mitsui, a Japanese Canadian veteran of the First World War. In August 1917, Private Mitsui led his platoon into the Battle of Hill 70. Out of a unit of 35, only Mitsui and four others survived. For his leadership and bravery Mitsui was awarded the Military Medal. After the war ended, Corporal Mitsui led his platoon across the Rhine and into Cologne. Despite the end of the war, and his promotion to sergeant in February 1919, Mitsui wrote of feeling “very depressed” because of the casualties his unit had suffered. In particular, the death of his good friend Kumakichi Oura in October 1918, affected him deeply. Sergeant Mitsui was officially discharged on 23 April, 1919. When Japanese Canadians were declared enemy-aliens during the Second World War, Mitsui and his family were ordered to report for internment. The Canadian government stripped Japanese-Canadians of their freedoms, possessions, property, and forced them to relocate to internment camps. When Sergeant Mitsui reported to the British Columbia Security Commission office, his daughter recalled that he threw his First World War medals to the ground in protest. “What good are these”? he asked the inducting officer. Throughout the remainder of his long life, Sergeant Mitsui marked his service privately: every year on Remembrance Day his would put on his uniform and medals to honour his fellow veterans. However, he never attended official ceremonies until 1983, when the City of Hamilton asked him to be a special guest at the municipal ceremony. Two years later, he was the honoured guest at the rededication of the Japanese-Canadian War Memorial, whose eternal flame was extinguished in 1942 when Japanese-Canadians were interned. Another grandson of Mitsui, David Mitsui, has been working with one of our researchers, Katherine Morrow, to have the Masumi Mitsui story included in our upcoming VMC project, launching November 2017. Mark donated documents relating to his grandfather’s story to the Centre for use in future research projects. We’re grateful to all descendants of Masumi Mitsui for sharing his story with us!